At the March 23 news conference at Kyiv’s Boryspil Airport, Europe’s leading low-cost carrier (LCC) Ryanair announced its intentions to launch flights to not one but two Ukrainian airports in October this year. The second airport would be Lviv, where an open skies regime has been in effect for some time. This marks Ryanair’s second attempt to conquer Ukraine. The airline denied plans to fly to Russia, but said it was in negotiations with Georgia. The carrier’s second pass at Ukraine is expected to be more aggressive than the first one. 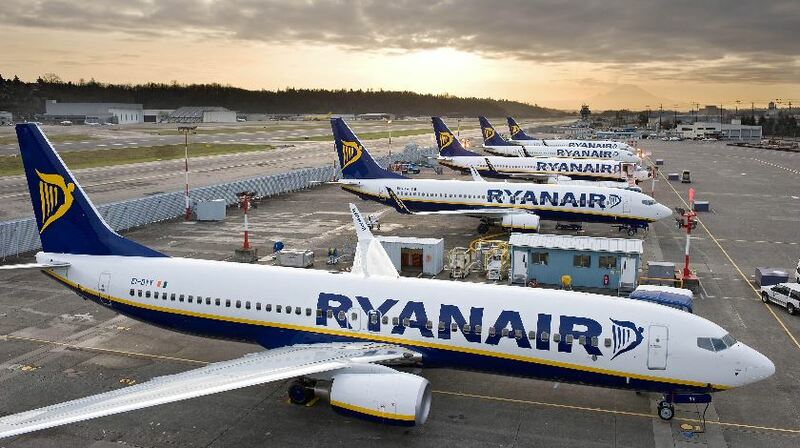 Ryanair’s plans, this time presented by CEO Michael O’Leary himself, include flights to 15 destinations from which is eventually going to be three Ukrainian airports, and even the creation of a local subsidiary, which would perform flights inside the country. The airline’s projected 2018-19 winter schedule includes 10 routes from Kyiv – to London Stansted (five times weekly), Stockholm’s Skavsta (thrice weekly), Vilnius (thrice weekly), Barcelona (four times weekly), Bratislava (thrice weekly), and also to five destinations in Poland – Warsaw’s Modlin (four times weekly), Wroclaw (thrice weekly), Gdansk (twice weekly), Krakow (thrice weekly), and Poznan (twice weekly). The projected network from Lviv comprises five routes – to London Stansted (thrice weekly), Dusseldorf’s Weeze (thrice weekly), Memmingen in Germany (twice weekly), Warsaw’s Modlin (thrice weekly), and Krakow (three times a week). Ryanair expects Ukraine to generate 800,000 passengers annually: 550,000 through Boryspil and 250,000 through Lviv. The airline plans to operate 32 weekly flights from Kyiv and 14 from Lviv, with one-way ticket prices starting from 9.99 euros. This is Ryanair’s second attempt to launch flights to Ukraine. Last year the carrier announced roughly similar plans, and even opened sales for flights from Kyiv and Lviv. The main emphasis was in fact on the latter city, whose network was supposed to include five destinations in Poland, Hungary, and Germany. The airline’s plans also included four routes from Kyiv to four destintions in the UK, Sweden, and the Netherlands, with a combined target of 510,000 passengers per year. However, the operator’s efforts to negotiate special conditions failed last year, which moved it to completely abandon the attempt. The routes announced by Ryanair this time indicate its tightening competition with another European LLC with strong positions in Eastern Europe, Budapest-based Wizz Air. The Hungarian airline has been flying to Ukraine for around 10 years now. It currently operates from Kyiv’s Zhulyany and from Lviv, but is also launching operations from Kharkiv in April. Many of Ryanair’s planned routes from Ukraine (at the very least seven of its routes from Kyiv) would actually coincide with Wizz Air’s existing ones, which leaves little doubt that the Irish carrier’s expansion onto the Ukrainian market is a direct challenge to the Hungarian competitor. Ryanair has been open about its plans to carve a niche in the Ukrainian market. According to O’Leary, the airline intends to launch flights from two or three more Ukrainian airports, and might even open bases in Kyiv and Odesa eventually. Further plans, post a local maintenance base with an IT division, the airline could go as far as creating a local subsidiary to operate flights within the country. This matches Wizz Air’s path of development in Ukraine, which had to be abandoned at some point. O’Leary says Ryanair is not planning to come to Russia. He admits that the airline is in talks with Georgia, but notes that the airline must have three or four airports in Ukraine before moving on to that country.